At least 50 people have died after high volumes of water caused a dam to break in Nakuru Province in Kenya. The dam broke on Wednesday after heavy rains poured a lot of water into the dam, causing it to break due to the unprecedented high volumes of water in a reservoir owned by large-scale irrigation farmer, Mansukul Patel. 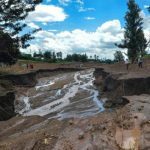 Nakuru Province governor Lee Kinyanjui told Reuters on Wednesday that county and national governments were still assessing the damage to ascertain how much damage the broken dam had caused. “The water has caused huge destruction of both life and property. The extent of the damage has yet to be ascertained,” said Kinyaunji. Water Resources Management Authority (Warma) spokesman Elizabeth Luvonga said the dams on Patel’s sprawling farm lacked the necessary permissions making them illegal. The farms manager however denied the accusations saying the dams had been constructed over 15 years ago.